Home >> 14th Amendment Conversatorio Online! Chief Judge Frances Tydingco-Gatewood, U.S. Magistrate Judge Joaquin V.E. 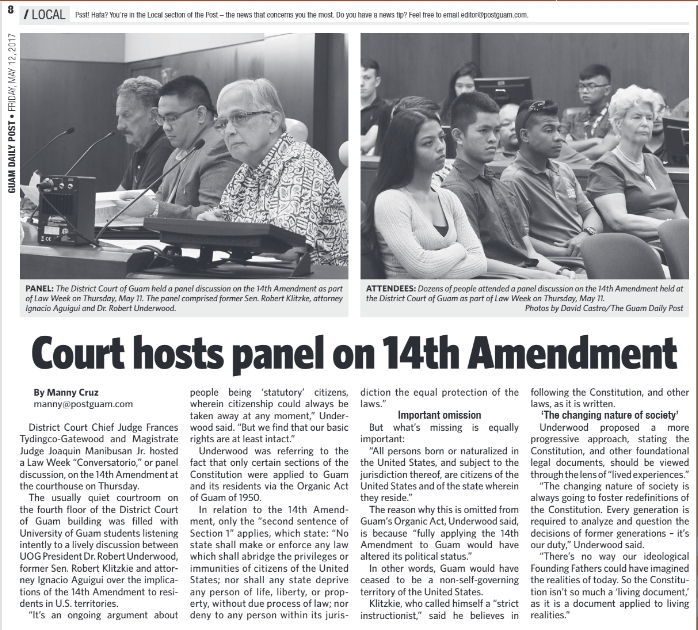 Manibusan, Jr. are pleased to announce that in celebration of 2017 Law Week, the court hosted a “Conversatorio” or panel discussion on the 14th Amendment at the courthouse on Thursday, May 11, 2017, at 10:00 a.m. An online video of the event is available for viewing. The invited audience was comprised of students from the University of Guam, Guam Community College, and members of the Guam Youth Congress. The discussion centered on the history of the 14th Amendment and its clauses, especially the Citizenship, Due Process and Equal Protection clauses. The panelists also provided their perspectives on the applicability of this constitutional amendment to Guam. The entire event was also livestreamed to YouTube at https://youtu.be/lEz_fl_B0_o or http://tinyurl.com/guam14th. A photo gallery of the event may be found here.